I don’t know if it’s because we at the halfway mark in Wes’ treatment plan, or because I am exiting crisis mode now that time has passed since we received any bad news about Wes, but I am feeling good! Last night I got super excited about being able to sit down on the couch, drink some wine, and watch Grey’s Anatomy. It doesn’t sound like the ultimate night to many of you, I know. What you don’t know though is that this has been my Thursday night ritual for at least two years. Jake sits in the study and plays computer games, I have my Grey’s. That ritual has been interrupted periodically by newborn baby stuff, reruns, and hospital stays over the last year or so. To have a “normal” moment last night……well, I was on cloud 9! Wes had his 3rd retinal exam yesterday and the doctors all feel good about the path the tumors are taking. They had planned to do another round of cryotherapy on the the right eye, as lab studies have shown that they typically need to do cryotherapy three times for the tumor to react as they would like. Of course my little man, being the super hero he is, didn’t even need a second round of cryotherapy because the tumor had reacted so well to the first round and the chemo! I’d like to give a little shout out to a few of the doctors who impacted us greatly yesterday. Thank you to the Pediatric Opthamologist, we shall call her Dr. Empathy (she was the one who diagnosed Wes and has made us really feel that she is with us every step of the way) – for going out of her way to take time to show Jake and Mary the pictures of Wes’ eyes from the first two retinal exams. Thank you to the Pediatric Anesthesiologist, we shall call her Dr. Lullaby (she speaks quietly and melodically, you can tell she works with kids a lot) – for advocating so much for us to get earlier surgery appointments going forward so when Wes can’t eat for 6+ hours before he is anesthetized it isn’t quite so negatively impacting for him. Thank you to our friend who works in the hospital as an anesthesiologist, we shall call her Dr. Superwoman (she works on the transplant team so I picture her standing atop the hospital with a cape just saving the world) – for arranging for Dr. Lullaby to be our anesthesiologist. Dr. Lullaby talked to us about sleep-training her 10 month old baby. Along with other friends’ stories and what I have been reading up on, we are feeling comfortable with giving it a go! We start tonight. Wish us luck! My heart is only about 60% of the way into trying this, but we will give it a go because mama is exhausted from getting up two times a night! I saw my mental health guy this week. I should come up with a fun name for him as well. This week we talked about some differences in who I am now versus who I was before Wes’ diagnosis. He asked if I can make decisions. Yes, if they pertain to Wes. Otherwise, I have been known to spend an hour walking around Target looking at things only to not actually buy anything because I couldn’t make a choice. This isn’t rocket science people, but I can’t choose between this kind of band-aid or that one. I was a decision maker before. That is definitely a term I would have used to describe myself. But pregnancy brain threw my decision ship off kilter for a while there, and then just when I got the ship righted, along comes Wes’ diagnosis and the ship is derailed. Wait, that would be a train. Whatever. Point is, decisions and I aren’t sympatico right now. This causes me distress. Until Dr. Note Scribbler asks me to think about what some of the good things are that can come out of not being the decision maker. Don’t ya know he just spun me for a loop on that one. Way to kick it into a new perspective doc! Perhaps some of my lightness of mood yesterday came from pondering that question. Wednesday was my best friends’ daughter’s 4th birthday. 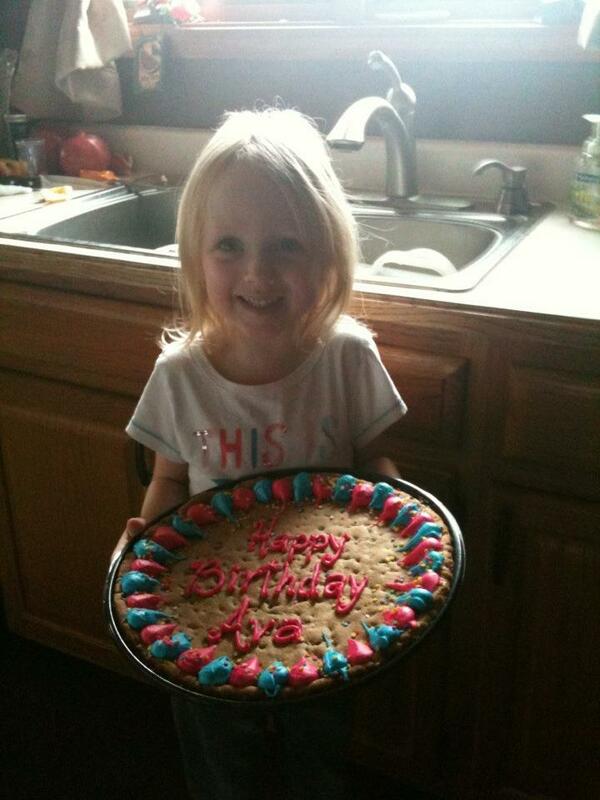 We didn’t get a chance to call sweet little Ava on her birthday, so I wanted to wish her a Happy Birthday here! We are calling her later today too, but what 4 year old doesn’t like to see a Happy Birthday wish splashed about?